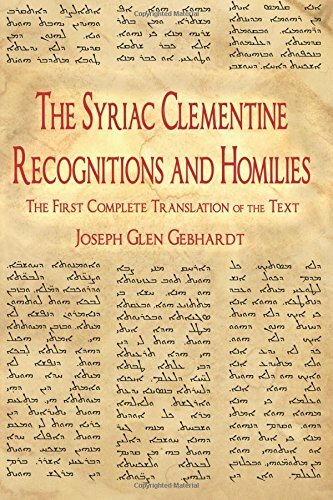 The Syriac Clementine Recognitions and Homilies is the first ever complete translation into a modern language of this important historical document relating to the origins of Judaism and Christianity. Found within the pages of the world’s oldest-dated manuscript, in any language, The Syriac Clementine Recognitions and Homilies tells the first-century story of a young Roman philosopher, Clement. Leaving his native land, Clement travels to the Middle East to meet the Apostles and records details of the original teachings of Jesus’ earliest followers. Clement also relays the travels of the Apostle Peter in his attempt to stop a false version of Christianity from being spread throughout the Roman Empire by an insidious deceiver. The narrative concludes with an amazing life story retold by the author. This astonishing document, having been suppressed for nearly two millennia, contains revelations about the formative years leading up to the split between Jews and Christians, and has the potential to revolutionize modern understandings of religion and philosophy. The text is written in Syriac, a dialect of the Aramaic language spoken by Jesus and his Apostles. The Clementine Recognitions and Homilies has previously only been available through altered Greek and Latin recensions and has become a topic of great controversy among Biblical scholars for the past five centuries. Now, for the first time, the oldest text-type is made accessible to the public in a complete English translation. Joseph Gebhardt is an instructor in Philosophy, Humanities, and World Religions. He graduated with an M.A. in Philosophy from the University of Nevada-Reno, having earned there his B.A. in Philosophy with a Minor in Anthropology (With High Distinction). He is a text contributor to the CAL (Comprehensive Aramaic Lexicon) Project at Hebrew Union College (Jewish Institute of Religion)-Cincinnati, and has served as a reviewer for Oxford University Press.